Sri Lanka’s GDP is likely to grow a further 7.0% by end-2016. Interestingly, the services sector contributes the lion’s share, 61%, to GDP. With strong growth in the services sector in the recent past, it has managed to create noticeable employment opportunities, helping public wages and salaries rise sharply. As per Sri Lanka’s Department of Census and Statistics (DCS), the estimated average household income per month at national level was LKR 45,878 in 2012/13 in Sri Lanka. Mean estimated household income increased by 25.9% from the previous survey year (2009/10) respectively. Colombo, the largest city and commercial capital of the country, since 2009 has seen improved confidence in the investment market which triggered an escalation in property values. Apart from the various infrastructure projects, an increased migration to Colombo (both from the rural areas and from outside the country) have emerged as the reasons behind real estate price rises. The rising number of high-net-worth individuals and other income segments resulted in a growing demand for housing. To fulfil the demand, developers continued acquiring land within the central and secondary sub-markets. Due to the limited availability of land in the city, select locations within the central and secondary sub-markets saw faster growth in land prices of around 7-8% on average annually. Increasing construction costs, high borrowing costs have made apartment prices unaffordable. As a result, the apartment market is largely restricted to only high-income-earning resident Sri Lankans (RSLs), non-RSLs and foreigners. Hence Colombo’s select current demographic conditions stress on unaffordable real estate to lower income group. Only the top 20% of income-earning households can afford to buy their dream homes in Colombo or its suburbs. Even the top 10% of households with a mean monthly income of around LKR 0.3 million can only afford a two-bedroom lower-mid property in a secondary location. Even in suburban locations, the top 10% of income-earning households may not be able to purchase a two-bedroom upper-mid apartment. Therefore, apartments in the Central sub-market and in upper-mid and luxury projects in the secondary sub-market have to rely on high net worth individual residents and foreigners. Limited income earners of Colombo are forced to opt for properties that are at least 20-25 km away from the city limits. The government can offer financial support to average income earners for the purchase of affordable housing. Make the construction sector more worthwhile for young people by offering opportunities for better qualifications and personal development to overcome labour shortage. The infrastructure of the suburban areas should be developed so that dependency on the city is reduced. Private developers are to be incentivised by engaging more and offering tax rebates. Administrative streamlining can be offered. The Government understands the current disequilibrium and to minimise the social inequality, it has been emphasising on affordable housing schemes. The provision of basic amenities such as sanitation, adequate water supply and power to the dwelling unit is crucial. In addition, community spaces and amenities such as parks, schools and healthcare facilities in the neighbourhood are desirable. While assessing the affordability of the buyer, the cost of the house should consider not only the purchase costs of the dwelling unit, but also the maintenance costs. An affordable housing project should be located within reasonable distances from workplaces and should be connected adequately through public transport. Since housing plus transportation costs will greatly affect affordability. According to Sri Lanka’s Urban Development Authority, in government promoted schemes, the number of affordable houses is going to double. 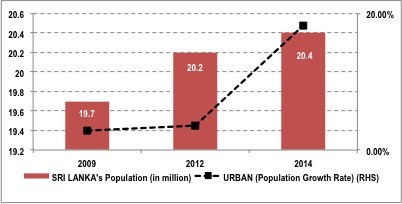 Population migration from the rural areas to the city suburbs is expected to grow, however initiatives taken by the government may not be sufficient. Housing needs of the economically weaker segment could be fulfilled if well-rounded efforts are made by the governments and private builders. This will not only create the synergy in real estate prices but also create the possibility of balancing the ecosystem of the city.